I’m a German girl. At least, that’s half my heritage. So could it be that its my inner fraulein that draws me to the glorious kohlrabi? In German, kohl means ‘cabbage’, and rabi means ‘turnip’. And that about sums up this funny-looking member of the Brassica family. It’s mild-tasting, somewhat sweet, crunchy – there’s a hint of cabbage and turnip in the flavor, but in my opinion, it rises above these two lower-profile vegetables. I’ve been gobbling up hunks of these knobby balls continuously since I first tossed one into my basket at a farmer’s market this summer. Honestly, this is my favourite raw vegetable du jour these days. 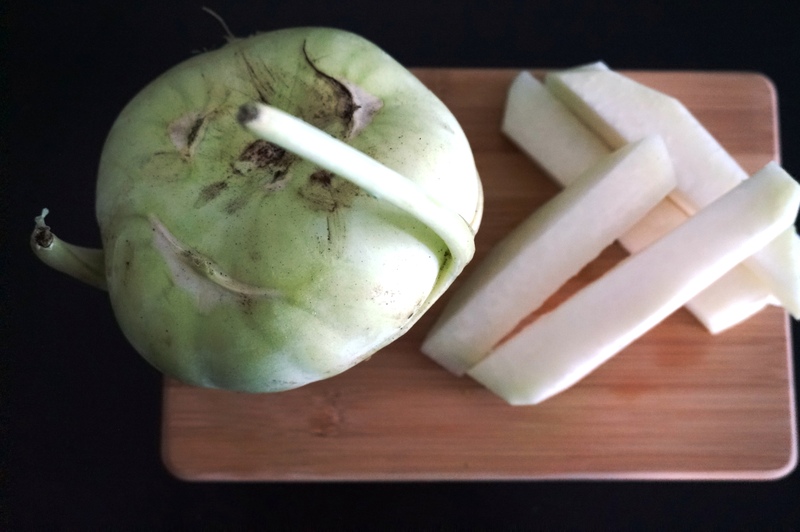 Not only is the kohlrabi delicious, it is (of course!) bursting with a happy nutritional profile. Most notable is its high vitamin C content. Packing more C than an orange, the kohlrabi supplies 84mg per cup of peeled chunks. That’s more than your daily requirement. Vitamin C boosts immunity and is vital for connective tissue, teeth and gums. And the fun doesn’t stop there. 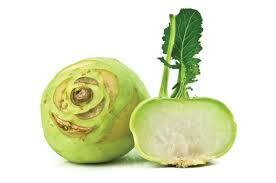 Kohlrabi is low in calories (a mere 36 per cup) and high in body-loving fiber. It boasts plenty of phytochemicals to protect cells against cancer. It is chock-full of minerals, like copper, calcium, manganese, iron, phosphorous and especially, potassium. Potassium helps regulate blood pressure, increases bone density, and plays a role in protein synthesis and the conversion of glucose to glycogen. B vitamins abound, helping with metabolism (and energy levels) and keeping your hair looking spectacular. This vegetable has long been enjoyed as a regular dietary staple in Central Europe and Asia, but seems to fall into the ‘what is that thing?’ category, barely evoking a glance when we’re out on our grocery runs. Apparently, the smaller ones are sweeter and juicier, but I like them any old size. Peel it and cut it into chunks. Take a bite. Now – whip up your favourite dip (a fresh guacamole is perfect) and smother your kohlrabi chunks. So good. Or you can cook it. 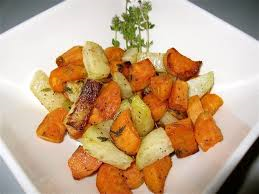 Peel, cut into chunks, and roast or steam with a medley of veggies – zucchini, sweet potato, onion, garlic and spices. Admittedly, I seldom cook my kohlrabi. I can’t seem to make it past the peeling stage before I start popping bits into my mouth.